Having a Muslim as a best friend (yes, Mariem, that’s you) means that I am constantly on the lookout for good halal restaurants. I have read very good reviews on Badoque and Mariem herself has commented about the huge portions and excellent food, making ever the more curious about this eatery. However, the first outlet at Simpang Bedok is simply too out of the way and I was elated when they finally opened another outlet at Upper Thomson. 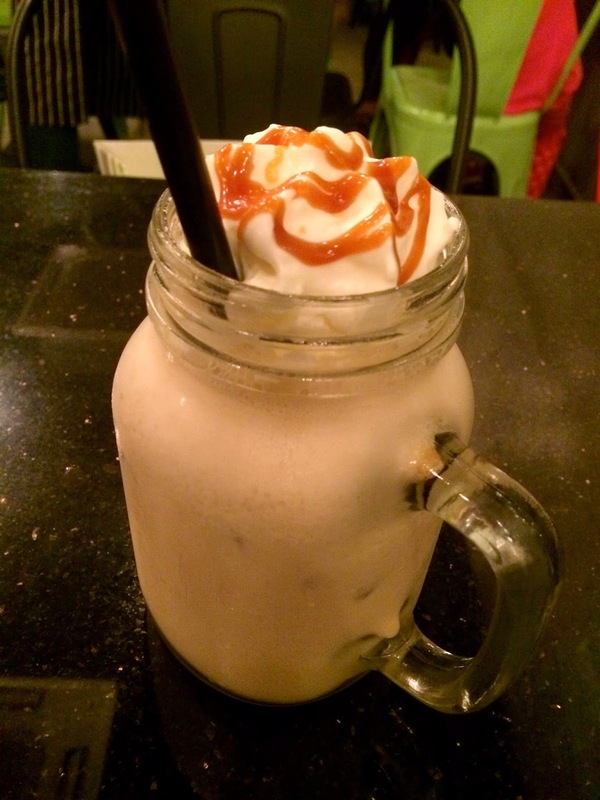 Doesn’t the name of this drink, Iced Salted Caramel, just sound so delicious? It is every bit as delicious as it sound. Thick melted vanilla ice-cream with whipped cream and caramel sauce. Heavenly. The Blue Oyster is highly-recommended by Mariem and she is right. It is delicious. Plump and juicy oysters are breaded and deep-fried till a brilliant rich golden color. Have them piping hot, dipped in mayonnaise. The taste of the sea and richness of mayonnaise will explode in your mouth. It is almost as good as the Oysters Grill & Bar Wharf‘s Fried Oysters, but it lacks a little because the oysters are not creamy enough. Badoque Ribs is recommended by the waiter who served us and it is a good recommendation. The ribs are fall-off-the-bone tender, glazed in their homemade B.B.Q sauce. It’s similar to Morganfield’s sticky bones, but not quite there yet. Rib Rye Steak doesn’t look very appetizing, but it tastes all right although the beef is a little grainy.